Explore the building blocks of life with Molecule World for iPhone. Molecule World combines science with art to show chemicals, proteins, DNA, and RNA in 3 dimensions. Stunning displays and a variety of coloring styles reveal hidden properties of atoms, bases, and amino acid residues. Pinch your fingertips apart to zoom in, pinch together to zoom out. Drag with one finger to turn molecules around. Drag with two fingers to move a molecule across the screen. Capture a picture of your work and share with your friends. 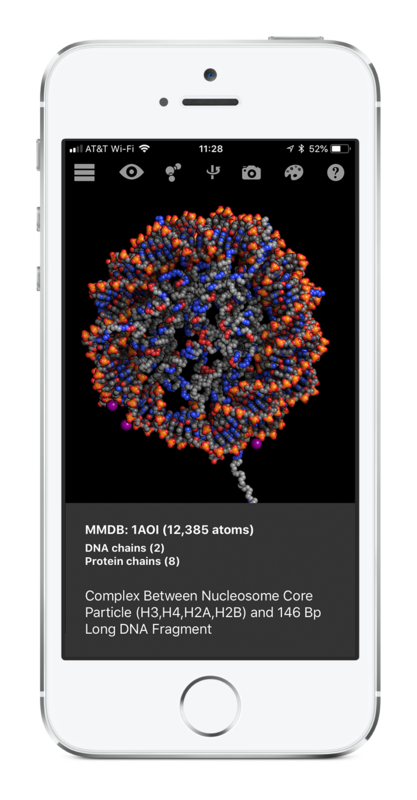 Download Molecule World for iPhone today! Questions about Molecule World? See Molecule World questions. Nucleosome (1AOI) with DNA - 12,385 atoms.